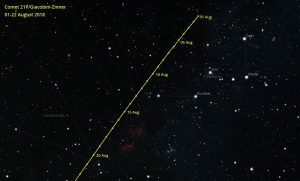 Comet 21P/Giacobini-Zinner has been well placed throughout June and July for northern hemisphere observers as the icy ball of dust passed through the high altitude, summer constellations of Cygnus and Cepheus. 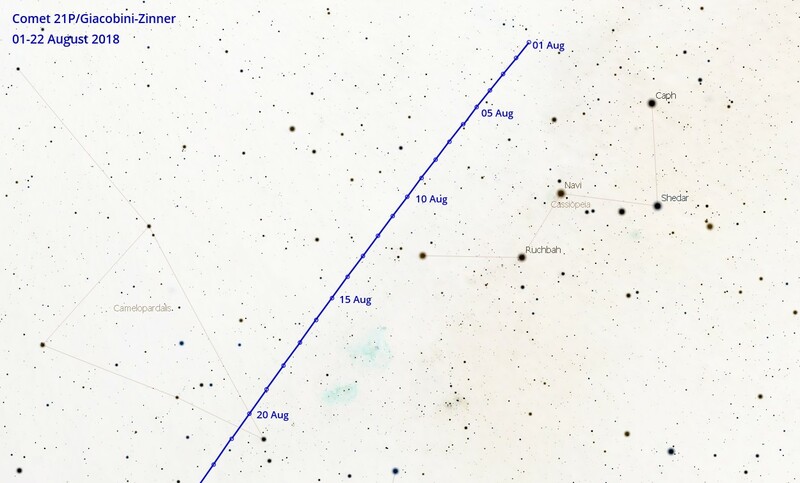 Now the comet (which has now reached magnitude 9) heads in to Cassiopeia through the first half of August followed by Camelopardalis. 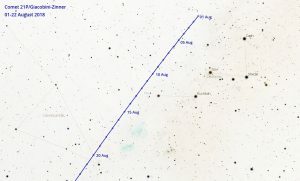 Between the 16-19 August, the comet will pass approximately 2° from the Heart and Soul nebula’s (IC1805 and IC1848) which would make for a decent widefield photographic opportunity. 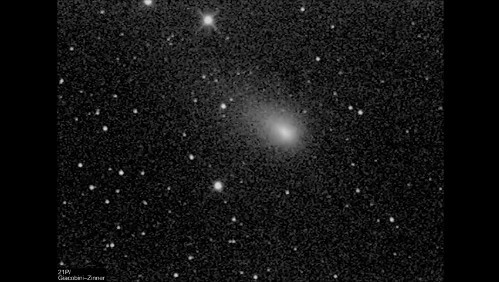 The Northbolt Branch Observatories released this time-lapse video of 21P on August 05, 2018. 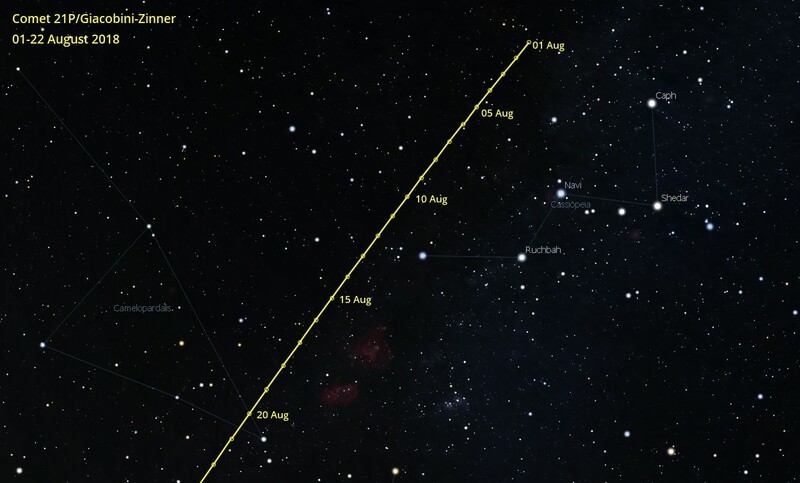 With 37 days to go until perihelion on 10/11 September, the comet is expected to reach magnitude 7. Although this is just outside the realms of naked eye visibility for most, it will make for a good binocular or telescope observing. when can we watch it by naked eye ? Hi Mohamed. As written in the article, the comet is only forecast to reach magnitude 7 which means it will not be quite bright enough to observe with the naked eye unless you have excellent, light pollution-free sky conditions and a keen eye for comet observing. Picked up about a degree of tail with 15×70 bins at 12.30am last night, head just about visible with averted vision – quite nicely placed at the mo with Cassiopeia acting as an anchor point for binoculars. Definitely not naked eye yet though. Thanks for the Map & Details. Armed with those it was an easy catch on Saturday night (Aug 11th) here in Northern New Mexico in 13″ & 17.5″ Coulters. Like Niall, we saw about a degree of tail with some hints of streamers in the tail when using the 17.5.